Grease and line a 900g. loaf tin with greaseproof paper. 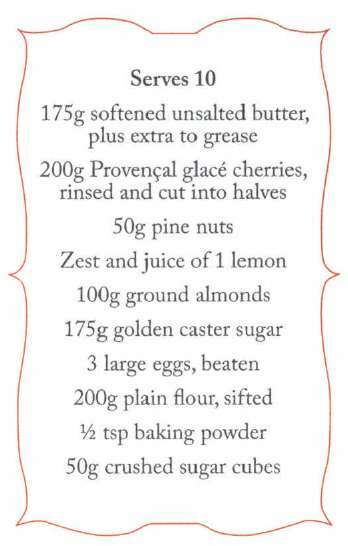 Put the cherries, pine nuts, lemon zest and ground almonds in a bowl. 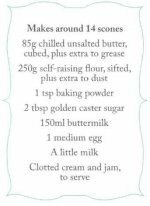 Cream the butter and sugar in large bowl until pale and fluffy, then gradually add the beaten eggs. 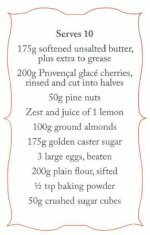 Fold in the sieved flour and baking powder using a large metal spoon, then the cherries and nuts and finally add the lemon juice to give a stiff dropping consistency. Spoon into the prepared tin and level the top. Sprinkle with the crushed sugar, then bake for about 11/2 hours until a skewer inserted into the centre comes out clean. Remove the cake from the tin and cool on a wire rack.